We left Glendeven Inn Mendocino in the early afternoon, after breakfast and coffee. We turned down Comptche-Ukiah rd., (just south of Mendocino) and we were on our way. The drive took us through windy county roads, with incredible natural scenery, tight turns, and the occasional pothole. The road snakes through ridge lines in the hilly countryside, offering stunning views into the valleys below and the wooded hillsides beyond. In almost a half hour, we reached Comptche, a sunny frontier town town, nestled in a hidden valley. On the main drag, we passed the school, the single convenience store (which doubles as a post office and gas station) and the fire station. Here we could take Flynn Creek Rd to connect with the 128 if we so desired. Today, however, we had a different destination. The road carried us onward, and we continued to enjoy the scenery as we winded onward to our destination, Montgomery Woods State Reserve. Montgomery Woods is located on a small alluvial flat, hidden away in a remote, steep-sided valley. The reserve started with a nine-acre donation by Robert Orr in 1945, and has been enlarged to 2,743 acres by purchases and donations from the Save-the-Redwoods League. This serene little grove is an isolated jewel, full of virgin groves of giant Coast Redwood (Sequoia sempervirens). At one point, the tallest tree in Montgomery Woods, named the Mendocino Tree (370 feet), was the world's tallest known tree. The tree lost its title in 2000, when a slightly taller redwood was discovered in Humboldt Redwoods State Park in Humboldt County, but looking up from the ground, what’s the difference of few feet? The tree is one of dozens of similar height in the grove, and looking up at any one of these towers impart a distinct feeling of smallness and awe on the viewer. We found that the serenity of the park, like many redwood groves, is best appreciated late in the afternoon.The late-afternoon summer sunshine reaches the valley floor, and provides a softer, more scenic light than the direct midday sun. Below the canopy of the towering redwoods, the ground cover is an especially plush carpet of sorrel dotted with large ferns. 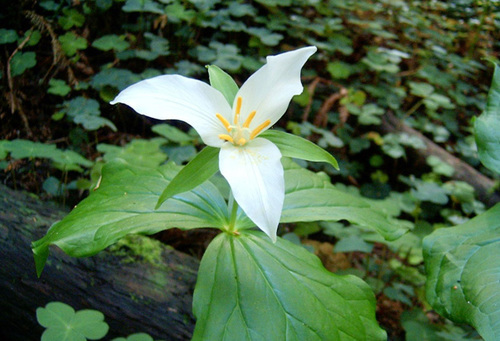 The occasional wildflower, like the lovely trillium, is a pearl on the verdant landscape. There are many interpretive signs that describe the local flora and fauna. One sign told us about the newts native to this region. This year has been unusually dry, and the water carved stream beds had nary a drop, so we fretted for the newts, but our fears were alleviated when we happened across a pond serene pond. Though newt-less on arrival, we knew that the nimble newt is a timid creature, and so we perched and waited, hoping for a newt sighting. Within minutes we began to see them in droves. In our humble assessment, there are few things cuter than these little newts swimming in the idyllic redwood pond. After a leisurely hike, and a lovely picnic, we found, to our surprise, that the day had already grown late. Rather than turning back, we continued onward to Orr Hot Springs, 2 miles to the east. We had heard of Orr Hot Springs before, but were surprised by just how lovely it was. The grounds are lovingly tended, and we found ourselves welcomed by clusters of dahlias and lilies. There are many private tubs, two saunas, two communal open-air spring-fed tubs . The 105-degree mineral-rich water has a sulphurous smell, but leaves the skin feeling cleansed and refreshed. After a long soak, there are trails for hiking and sundecks for curing tan lines. At night, the two rooftop claw-foot bathtubs offer a perfect perch for stargazing beneath the unpolluted sky. At the end of a beautiful day, we began the journey back to the coast. A beautiful sunset painted crimson skies over the rolling hills. As the first stars twinkled in the twilight, we felt in our hearts that this was truly a day well spent.